It’s Foodie Friday, and this week’s topic is the very serious business of the very serious food magazines. 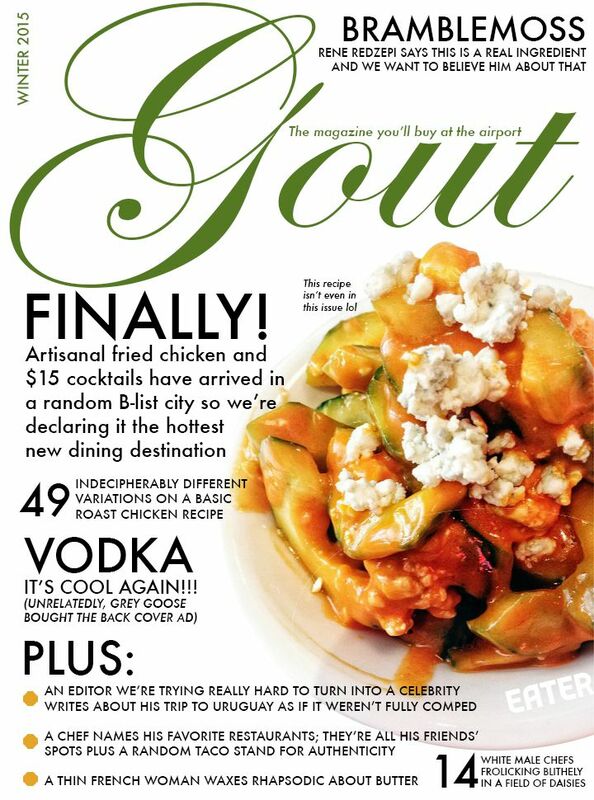 I was reminded of this by something Eater.com does every so often, which is to publish the cover of a mock foodie rag called Gout. You can see the covers here and here. While it may look like a legit food magazine, with article titles such as “Summer! It literally comprises 1/4 of every year but we’re going to explain all the food as if you’ve never previously considered grilling burgers before!” it clearly isn’t. But that rant isn’t my point today. What Eater has done here is something we all need to do a lot more often: poke fun at ourselves. After all, unless we really are brain surgeons, EMT’s, firefighters or a few other professions, it’s not as if what most of us do is life or death. In fact, I’ve often said that the best part of my job is that if I screw up, nobody dies. Business is hard. It can be horrible sometimes. It is very serious most of the time. Because of that, every so often we all need to do what Eater has done – recognize the silly stuff inherent in our industry, and laugh. Honestly, while a great meal may leave you happy and satisfied, a good laugh is better for your health.